If you're working on an iOS device and using an attached keyboard, then use option+tab to move between user-interface elements (such as links, buttons, tabs, etc.). 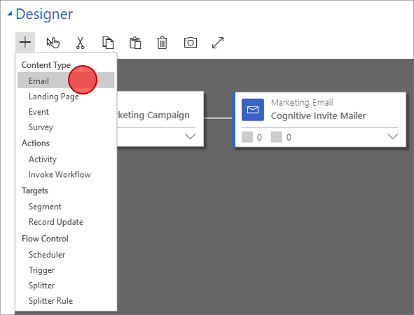 The standard keyboard navigation technique for this is to use tab alone, but because Dynamics 365 for Marketing sometimes uses specialized HTML constructs to create its feature (especially for the content and pipeline designers), some buttons and links will be skipped if you use tab alone. But if you use option+tab, you'll be able to navigate to everything. 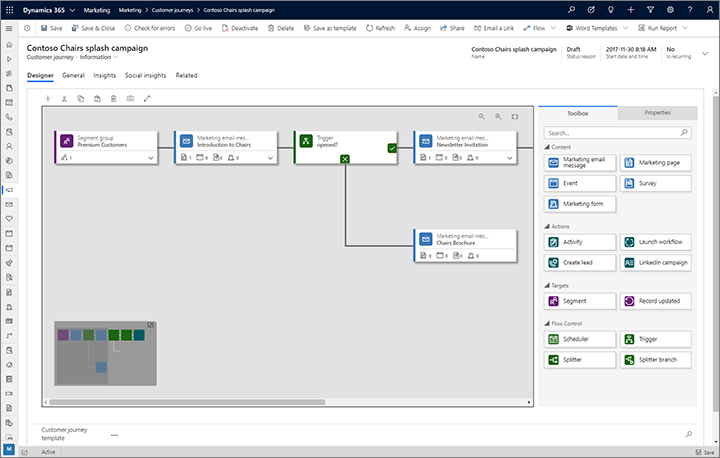 Dynamics 365 for Marketing provides advanced digital-content designers for creating, styling, and previewing the various types of digital content that you can produce and manage with the system. This section lists keyboard shortcuts and accessibility features are available for working with the designers for marketing email messages, marketing pages, and marketing forms. For keyboard shortcuts that include a number, you usually need to use the standard number keys, not the number pad. Alt+0: Opens the Accessibility Instructions dialog box. Alt+F10: Enters the toolbar or the tab list of the currently open dialog box for editors other than the email editor. Alt+F9: Enters the toolbar or the tab list of the currently open dialog box (email editor only). Tab: Moves to the next toolbar button group, context menu sub-option, elements path element, dialog box element, or dialog box tab while in the tab list. 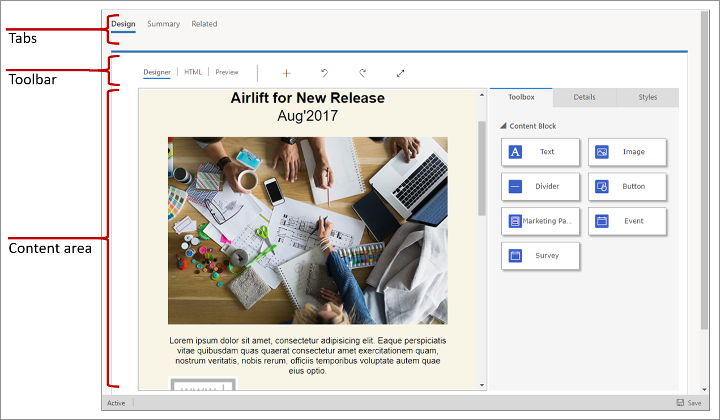 Right arrow: Moves to the next toolbar button within the group, context menu sub-option, elements path element, dialog box element, or dialog box tab while in the tab list. Tab or Down arrow: Moves to the next drop-down list or context menu option. Shift+Tab: Moves to the previous toolbar button group, context menu parent option, elements path element, dialog box element, or dialog box tab while in the tab list. Left arrow: Moves to the previous toolbar button within the group, context menu parent option, elements path element, dialog box element, or dialog box tab while in the tab list. Shift+Tab or Up Arrow: Moves to the previous drop-down list or context menu option. Spacebar or Enter: Activates a toolbar button, a context menu option, a drop-down list option, an elements path element, or a dialog box tab after it is selected. Also activates a context menu sub-menu, if one is available. Alt+Ctrl+0: Go to the menu bar. Alt+Ctrl+1: Open the desktop preview. Alt+Ctrl+2: Open the tablet portrait preview. Alt+Ctrl+3: Open the tablet landscape preview. Alt+Ctrl+4: Open the mobile portrait preview. Alt+Ctrl+5: Open the mobile landscape preview. Alt+1: Open the Designer editor tab. Alt+2: Open the HTML editor tab. Alt+3: Open the Preview tab. Alt+11: Toggle the full screen view of the design editor. Alt+M: Move the selected element. Alt+Shift+C: Clone the selected element. Alt+Shift+D: Delete the selected element. Alt+4: Open the Toolbox panel. Alt+5: Open the Properties panel. Alt+X: Go back to the active element (for example, from the Properties panel). When a text element is selected, you are able to enter and style text within that element. The keyboard shortcuts listed in the following subsections are active while you are working with a text element. Home: Goes to the beginning of the line. Ctrl+Home: Goes to the beginning of the text element. End: Goes to the end of the line. Ctrl+End: Goes to the end of the text element. Page down: Scrolls down the text element, by approximately the length of the editing area. Page up: Scrolls up the text element, by approximately the length of the editing area. Enter (Return): Ends a paragraph and starts a new one. Shift+Enter: Adds a line break. Shift+Ctrl+3: Enables entering content (by adding a new paragraph) before a problematic element such as an image, table or <div> element that starts or ends a document, list, or even adjacent horizontal lines. Shift+Ctrl+4: Enables entering content (by adding a new paragraph) after a problematic element such as an image, table or <div> element that starts or ends a document, list, or even adjacent horizontal lines. Backspace or Del: Deletes a character. Ctrl+Backspace or Ctrl+Del: Deletes a word. Ctrl+Z: Performs the undo operation. Ctrl+Y or Shift+Ctrl+Z: Performs the redo operation. Ctrl+X or Shift+Del: Cuts a text fragment to the clipboard. Ctrl+C: Copies a text fragment to the clipboard. Ctrl+V or Shift+Insert: Pastes a text fragment from the clipboard. Shift+Ctrl+V: Pastes content from the clipboard as plain text. Ctrl+A: Selects all the contents of the current text element. Shift+Arrow: Selects a text fragment by letters. Ctrl+Shift+Arrow: Selects a text fragment by words. Shift+Home: Selects a text fragment from the cursor to the beginning of the line. Shift+End: Selects a text fragment from the cursor to the end of the line. Ctrl+Shift+Home: Selects a text fragment from the cursor to the beginning of the text element. Ctrl+Shift+End: Selects a text fragment from the cursor to the end of the text element. Shift+Page down: Selects a text fragment of approximately the length of the editing area starting from the cursor and going down. Shift+Page up: Selects a text fragment of approximately the length of the editing area starting from the cursor and going up. Ctrl+B: Applies bold formatting to the selected text. Ctrl+I: Applies italics formatting to the selected text. Ctrl+U: Applies underline formatting to the selected text. Ctrl+Shift+C: Copies the inline formatting from to the selected text and enables sticky mode. Ctrl+Shift+V: Applies the previously copied inline formatting to the selected text. Ctrl+L: Opens the Link dialog box. Alt+Down-Arrow: Open assist edit inside a text element. Alt+Down-Arrow or Down-Arrow: Open assist edit inside the link field (or any field that supports assist edit). Most of the standard navigation and selection keyboard commands also work when you are designing a customer journey or lead scoring model. In addition, some special assistance is provided to let you work with the tiles and arrange them on the canvas. Press tab until you've selected the currently active canvas tab (Toolbox, Properties, or Grades). Use the arrow keys to choose the tab you want to switch to. The canvas tab is activated as soon as you select it. Press tab to move between settings available in the active canvas tab, or to navigate away from the canvas tab. Press tab until you've selected the Add button in the canvas toolbar. Press space to open the Add menu. Use the arrow keys to select a tile type from the Add menu. Press space to choose the tile type currently selected in the Add menu. Use the arrow keys to select where you want to insert the new tile in the pipeline. Select a new-tile position to place the tile in a new position, or select an existing tile to place the tile as a child of that tile. Press space to place the tile in the selected position. Press tab until you've selected the canvas. Use the arrow keys to select the target tile. Press delete to delete the selected tile. Use the arrow keys to select the tile you want to cut or copy. Press Ctrl+V to activate paste mode. Use the arrow keys to select where you want to insert the copied tile in the pipeline. Use the arrow keys to select the tile you want to expand. Press space to expand the tile. Use the arrow keys to move among the exposed child tiles. Make sure the Properties canvas tab is active as described in Move between canvas tabs. Use the arrow keys to select the tile you want to configure. Press enter to open the selected tile's settings in the Properties canvas tab. Press tab until you've selected the property you want to set in the Properties canvas tab. Use the standard keyboard shortcuts to enter or choose values as needed. To move quickly between the main areas of the customer journey and lead-scoring model designers, you can use the following shortcuts. Alt+1: Go to canvas toolbar. Alt+2: Go to first tile on the canvas. Alt+3: Go to Toolbox/Properties panel. Ctrl+Alt+D: Go to the selected tile. Ctrl + F6: Remove focus from the calendar (for when you want to leave the calendar). Ctrl + Shift + G: Open the date picker (for when you want to change the date/time settings for any calendar item).